When Roo first started school full-time the school she attended had just become a forest school, something I was unfamiliar with at the time. It transpired that they wanted to get the children outdoors more, which included getting up close to nature on trips to the local woods. During these sessions, she learnt about different types of trees, leaves, plants and insects alongside how to build dens, carry sticks etc. Having the opportunity to attend Forest School sessions has wet her appetite for the outdoors and whilst she still isn’t that keen on creepy crawlies she does love to wander around the woods to see what plants, leaves etc that she can find and point out to us. The Hello Nature – Draw, Colour, Make and Grow book offers any nature loving child the opportunity to complete activities, puzzles and learn facts about the world around them. This is the perfect book to encourage families to get out of the house and celebrate the beginning of Spring, whilst keeping the kids occupied over half-term! If it’s still feeling rather chilly, it also includes great winter-time activities such as drawing a spider spinning its web, a guide to snowflakes, collecting pine cones and acorns, ‘Open Your Own Bird Restaurant’ and guides to squirrels and hedgehogs. 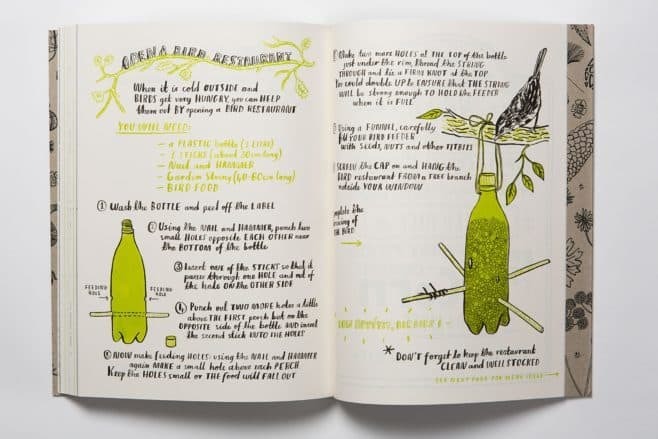 This large hardback book provides hours of fun, whether you take it with you on an outing to your local woodland, are passing the afternoon away in the garden or are looking to get creative and make your very own bird feeder using an old water bottle. The Hello Nature – Draw, Colour, Make and Grow book has really captured Roo’s thirst for getting outdoors and with our recent house move to somewhere with both a garden and a nearby woodland I can see this book coming along with us on many walks whilst we explore the neighbourhood. The Hello Nature – Draw, Colour, Make and Grow book is priced at £12.95 and is available from Amazon and all other good book retailers. 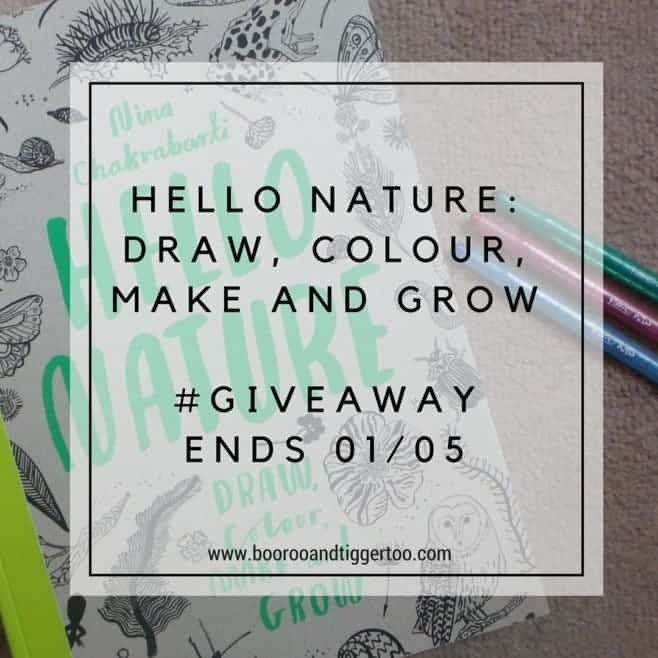 Boo Roo and Tigger Too are lucky enough to have two copies of the Hello Nature – Draw, Colour, Make and Grow book to giveaway. The ferry meadows where we live. Enough space to go biking, feeding the duck and picnic. The beach (Saltburn) is always a favourite. My niece loves the outdoors, my parents have chickens and sheep and she loves going out there! This would be a great companion to our expeditions! On the moors near our house. My little boy loves going to the park. We love going for woodland walks! We love going to the beach or to our local park for a picnic. We love Thetford Forest, as they have wide open spaces and lots of adventure equipment. We love going to our local park. We love to go to the woods or the beach. Even in winter! We love to go to a local beach, it has pebbles rock pools & cliff walks. We love going to the woods and exploring. We do not own a car so are usually restricted to the local play area. However, a new park has recently opened with lots of trees, ponds and picnic places so we will be heading there as often as we can this year. I love taking my boys out for walks at the local Arboretum. I used to take our 4 children and know our grandchildren to our local park and feed the squirrels and ducks. I take my grandchildren along the Stratford-upon-Avon canal. We like to go hiking in the Lake District. Lovely giveaway, thank you. Walking in the park is a favourite but we hope to be able to go further afield soon. We have a big wide open space with a pond in it called South Hill Park. My kids call it Silver Park and it’s about a 25-30 mim walk to get there by foot. It’s a nice walk and they get to go through the wooded area first! We’ve been looking for Fairies recently! We like to visit the Peak District.